Sometimes – it’s not very often – you read something that, completely unexpectedly, just blows you away. It’s usually something you picked up on a whim, and having read it, you immediately wish you could return to a time before you’d read it, so could can rediscover that joy for a second time, and bottle it, and hold onto it forever. 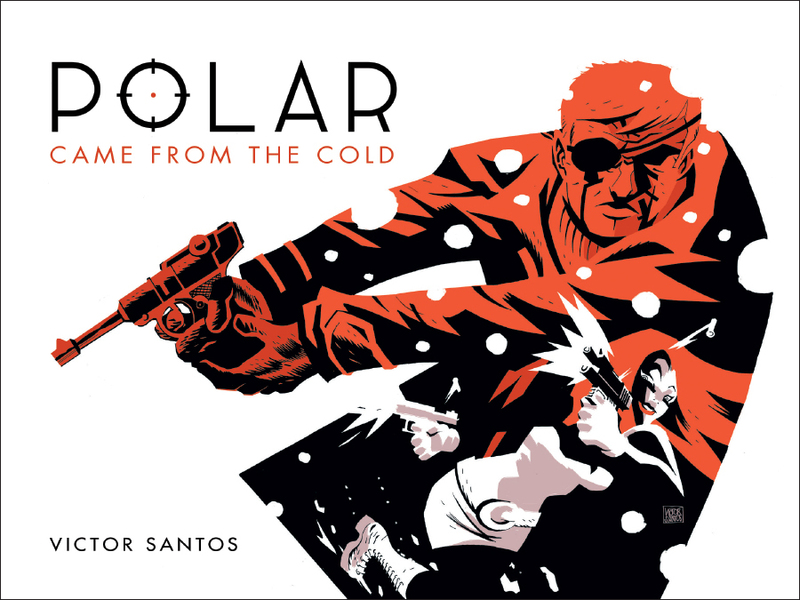 POLAR: CAME FROM THE COLD was one of those. This graphic novel – originally a web comic – floored me. Writer and artist extraordinaire Victor Santos has created a tale so in tune with my tastes, it’s like he pulled ideas from my own head and executed them on a level I could only dream of. This is an action-packed assassin versus assassin take coated in a thick layer of noir. Santos’s artwork is very reminiscent of Steranko and Miller, and coloured in blacks, whites and oranges, it’s just gorgeous on the page. Text is sparse in POLAR. There are no captions to clutter the artwork, and dialogue is kept to a minimum. It’s wonderfully effective. Our main character is an ex-agent named Black Kaiser, who is the intended victim of a failed assassination attempt. It seems his former employer wants him dead – but he’s not going to go easy. This plot, in a nutshell, sounds derivative, and to a point, I suppose it is. But this is all about the narrative’s execution, which is flawless, and stylish, and just so darn entertaining. This is a bloody and violent tale. It’s not for everyone. But for me, this is comic book perfection. A must read.